Samantha Power, the new United States Ambassador to the United Nations, is the youngest person to ever hold that position. 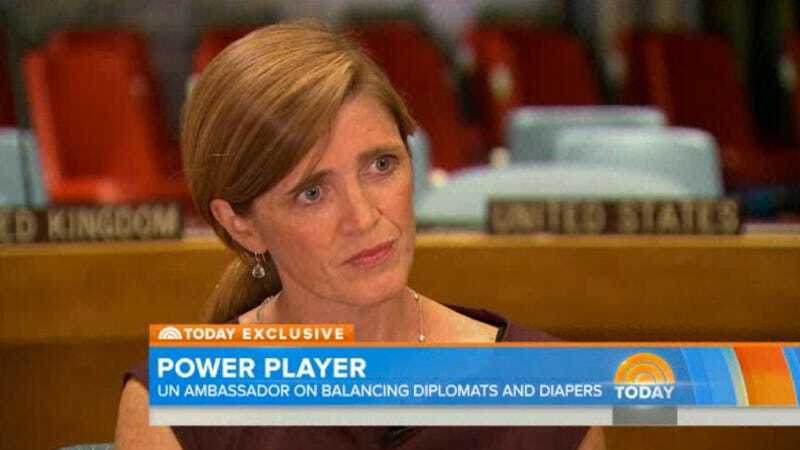 And while she's written a Pulitzer-prize winning book about genocide, the Today Show description of an exclusive interview with Power reads "balancing diplomacy, diapers." Get it? She has kids. Power is 43 and has two kids under the age of 5, ONE of whom wears diapers. Strangely, while Savannah Guthrie's interview with Power does touch on her children, there's actually no mention of diapers. Someone just decided that "diplomats and diapers" sounded good and slapped it on the chyron at the bottom of the screen. Power's thoughts on Syria (“We think it is very significant that Syria is now legally required by the world, by Russia and the United States, to give up its chemical weapons”) and Iran's new leader ("There is a diplomatic window, but it won't remain open forever") do get good chunks of airtime in the piece. It's clear that Guthrie is trying to paint a full portrait of a fascinating, intelligent, powerful woman, and bringing her kids into it is part of that. Still, would a male ambassador's exclusive have the word "diapers" on the screen for the entire seven minutes? Anyway! The best part in this snippet of video is when Savannah Guthrie asks, "Is it harder than you thought it would be to be a mom of two little kids and have this huge new job?" And Powers' son wanders into the kitchen and stares at a rack of knives.